Heaven looks a lot like the city of Jerusalem, only with better views. Or I should say Jerusalem is patterned like heaven. Fact is, in time Jerusalem will look more and more like heaven. If you want to be able to find your way around heaven all you have to do is scroll down and check out your Map of Heaven! There is a mountain in Jerusalem called mount Zion. There are other mountains or hills that are called Zion but the true mount Zion is located on the south east corner of Jerusalem. It is also called the “city of David”, or the “hill of Ophel”. King David had his palace and throne on mount Zion. Some think that his son Solomon built his temple on mount Zion. One day mount Zion in Jerusalem will become a very high mountain and Jesus will rule the world from his throne there. You can easily find it on your map of heaven. Psa 48:1-2 A Song and Psalm for the sons of Korah. Great is the LORD, and greatly to be praised in the city of our God, in the mountain of his holiness. 2 Beautiful for situation, the joy of the whole earth, is mount Zion, on the sides of the north, the city of the great King. Jesus is the great King. The north sides of mount Zion will be where Jesus sets his throne on earth. The north side of mount Zion faces Jerusalem. God in heaven also faces Jerusalem. There is also a mountain in heaven where God is seated on his throne. The Devil has seen it and boy is he jealous! He wants to be like God and sit on the throne on the north side of the heavenly mount. Isa 14:13-14 For thou hast said in thine heart, I will ascend into heaven, I will exalt my throne above the stars of God: I will sit also upon the mount of the congregation, in the sides of the north: 14 I will ascend above the heights of the clouds; I will be like the most High. 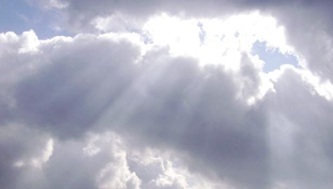 God’s heavenly throne is on the north side of the holy mountain in heaven. 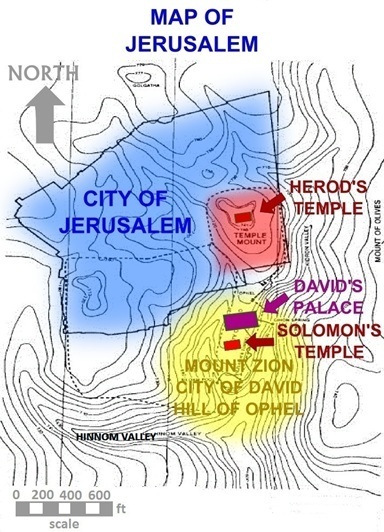 King David’s palace has been found on the north side of mount Zion in Jerusalem. Hebrew University archaeologist, Dr. Eilat Mazar has located the site. Read “Is It the Palace of King David?” by Sarah H. Moore at www.leaderu.com. There have been two chief temples in Jerusalem. The first was King Solomon’s temple (1Ki 6). Construction began in 960 B.C. ; it was destroyed in 606 B.C. by the Babylonian Empire. The second was Zerubbabel’s temple (Ezr 6-8). Construction began about 520 B.C. ; it was plundered and defiled by Antiochus Epiphanies in 167 B.C. It was restored by Judas Maccabeus and latter renovated by Herod the great. So it is sometimes known as Herod’s temple. Zerubbabel’s temple (or Herod’s temple) was destroyed by the Roman Empire in 70 A.D. There will be two more temples built in Jerusalem. The next temple (or holy place) will be built by Israel and will stand during the seven year “Tribulation period” (Dan 9:27, Mat 24:15). 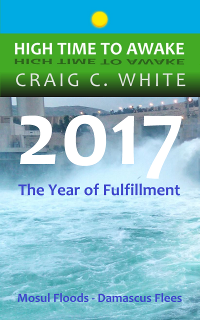 The final temple will be built by Jesus and will stand during the one thousand year “millennial” reign of Christ on earth (Eze 40-47:12). There is also a temple in heaven. Why would God need a temple? Does He make sacrifices? Yes, only one. God’s temple is shown on the Map of Heaven. The glory of God occupied King Solomon’s temple. The heavenly temple is God’s holy headquarters. If I told you that there is a city in Jerusalem, I’m sure you would believe it. There is a city in heaven. Abraham believed it and he didn’t even have a map of Heaven! 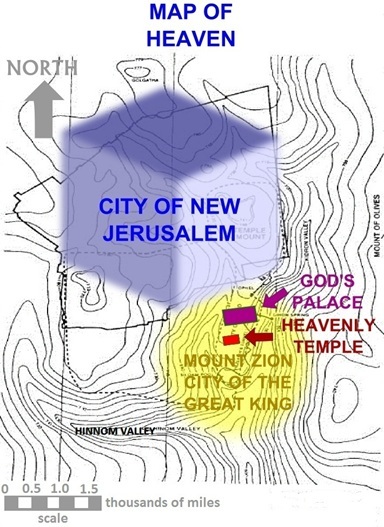 The holy city is called “New Jerusalem”. It is about 1,500 miles square! The heavenly city is coming to earth. Jerusalem will look more and more like heaven. Jesus used the word Gehenna to describe the everlasting destination of the unsaved. The English word “hell” is translated from the Greek word Gehenna in the following verses. It is easy for us to see the valley of Hinnom in Jerusalem. But there may be a much deeper valley burning in heaven. Jesus and the angels will watch the everlasting burning of the damned. You are lucky to have a map of heaven. Today if you die, having put your trust in Christ, your spirit will be immediately ushered into the presence of God in heaven. That is good news. But even better news is that you will soon return to Earth with Jesus to receive your restored body. That’s right you’re going to get your body back, only it is going to be improved. Won’t that scare your relatives? When Jesus comes at the resurrection the dead will rise in their new bodies and the bodies of those still living believers will be changed into everlasting bodies. After that, we will return to heaven in our renewed bodies to watch the unfolding of Israel’s final seven years of indignation spoken of by the Prophet Daniel (Dan 9:24). During that time we will also witness the wrath of God on all nations. When you are in heaven in your new body don’t forget your map. And hold on to it when you come back to earth. Come back to earth? Yes sir, I’m sure that you know that the meek shall inherit the Earth. Now that you have your Map of Heaven you will be able to find your way around in Heaven and on Earth. After all, in time Jerusalem will look more and more like Heaven! Be sure that you get a chance to use your Map of Heaven, read Can I be saved? I’m not perfect! Hi Lee. Revelation 19:20 seems to indicate that the Antichrist and the False Prophet are two separate people. Rev 13:11 describes a two headed beast that I think represents a world religion that the False Prophet comes from. This world religion is formed after the next world empire.